Rachel Corrie (born as Rachel Aliene Corrie in Olympia, Washington, United States, died in Rafah, Gaza Strip) was a famous Activist from USA, who lived between April 10, 1979 and March 16, 2003. She became only 23 years old. 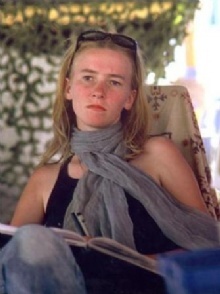 Aliene Rachel Corrie was an American woman who was a member of the International Solidarity Movement (ISM). She was crushed to death in Gaza by a bulldozer belonging to the Israeli Defence Forces (IDF) when she worked as a human shield. The IDF claims that the death was due to the bulldozer driver had limited visibility. Eyewitnesses from the ISM reported that there was anything that could obstruct the road. The american musician David Rovics has a song about her called The Death of Rachel Corrie. Our collection contains 5 quotes who is written / told by Rachel. "I feel like I'm witnessing the systematic destruction of a people's ability to survive. It's horrifying"
"Follow your dreams, believe in yourself and don't give up"
"We are protecting civilians. We are unarmed. We are no threat to you. Please do not shoot"
"We should be inspired by people... who show that human beings can be kind, brave, generous, beautiful, strong-even in the most difficult circumstances"
"Sometimes I sit down to dinner with people and I realize there is a massive military machine surrounding us, trying to kill the people I'm having dinner with"